Dr. Richard Richter and his team at Patchogue and Hampton Family Dental are committed to serving the smiles of our local community, as well as families in Holbrook, Brookhaven, and neighborhoods throughout Suffolk County. 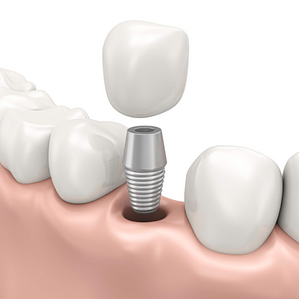 Whether you are missing one tooth or several, we offer dental implants to restore full function to your smile. We perform both implant placement and restoration in-house, working with you every step of the way. Dental implants are made up of three parts: the implant post, which is made from durable titanium; the abutment, where your restoration will be secured; and the crown, which both resembles naturally healthy teeth and is made to endure typical function. When you are missing teeth, it’s important to have them replaced to preserve the strength of your jawbone and support proper digestion. The loss of even one tooth can compromise your oral and overall physical health. Dental implants help you retain normal function while also improving or maintaining the aesthetics of your smile. We offer a variety of different restoration materials, ranging from gold crowns to zirconia. Depending on your specific needs, we can create your restorations in-house with our CEREC machine or have them developed at a trusted off-site lab. If your jawbone isn’t strong enough to support implants, we also perform the necessary procedures, such as bone grafting, ridge augmentation, and sinus lifts, to help you become a more suitable candidate. The successful outcomes we achieve with implant place is due in part to our use of advanced technology. We use cone beam CT scans to digitally map your teeth and mouth, and direct the fabrication of surgical guides, ensuring placement is accurate. This allows us to take care of planning out procedures in advance, reducing treatment times. We work with a periodontist with extensive training and practical experience with dental implants so that the service our patients receive is as effective as possible. Schedule an Appointment at our Patchogue Office Today! If you’re in need of a permanent replacement for missing teeth, Dr. Richter provides dental implants to restore both the appearance and function of your smile. Call Patchogue and Hampton Family Dental today and schedule an appointment to learn more about your treatment options.